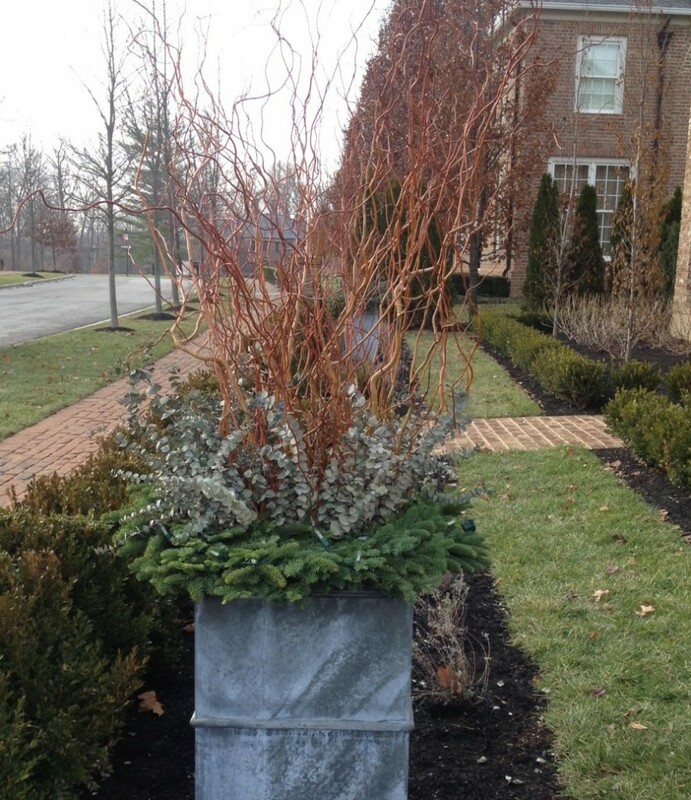 Yesterday my article on Garden Design was published about using ornamental branches in containers. I intended to have a blog post up to accompany the article, but have been so busy creating client holiday containers and hanging decorations I got a little behind on the blog. The stems used in the article and for clients are all grown on our farm in Johnstown, Ohio next to our offices. 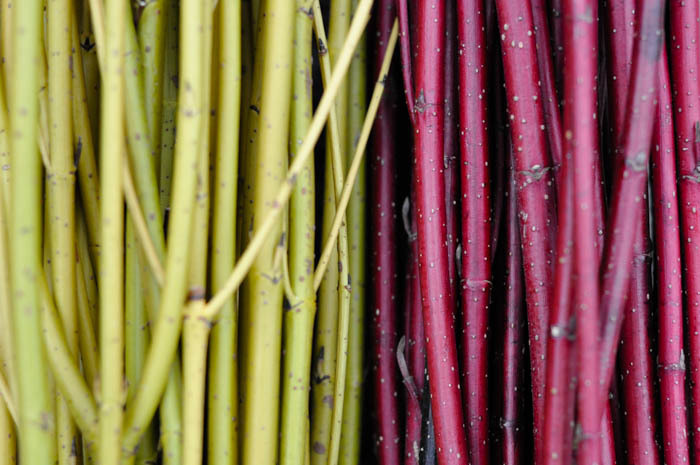 The farm is named Red Twig Farms directly after the scarlet bark of the dogwoods. You can find more information about the farm on previous posts here. We have hundreds of plants that we harvest from each fall after the leaves fall and the bark has reached its peak color. By cutting back, coppice, each year we ensure the new growth comes back in tall single branch formats. Depending on the age and species of the plants we can get between 2 and 6 feet plus length branches. We grow red and yellow twig dogwoods. The red is great with the seasonal colors for christmas and the yellows are great all the way into spring. 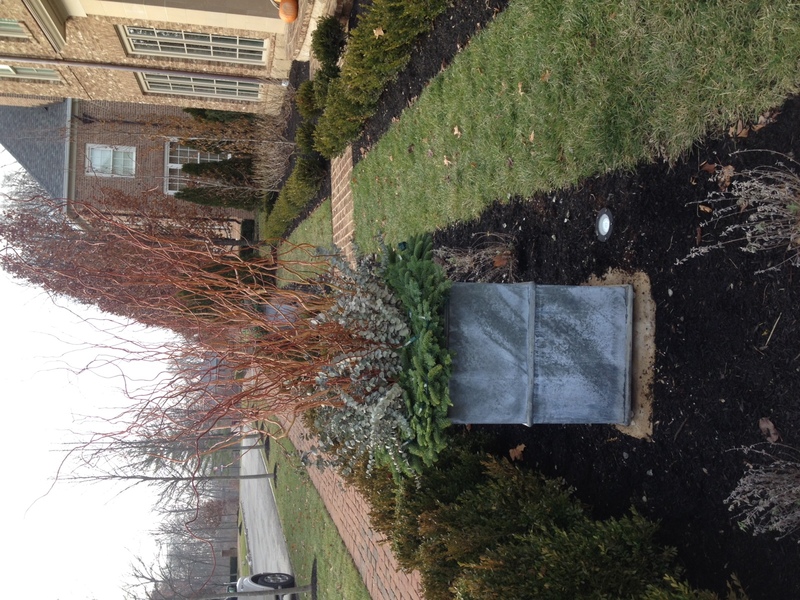 I like to use as many branches as possible in my container designs, the bundles above show 50 stems. The dogwoods are also very upright, so you can cram a lot into a container without spreading out too far in width. However you can also use just a few and will pop against any greens added to the container. 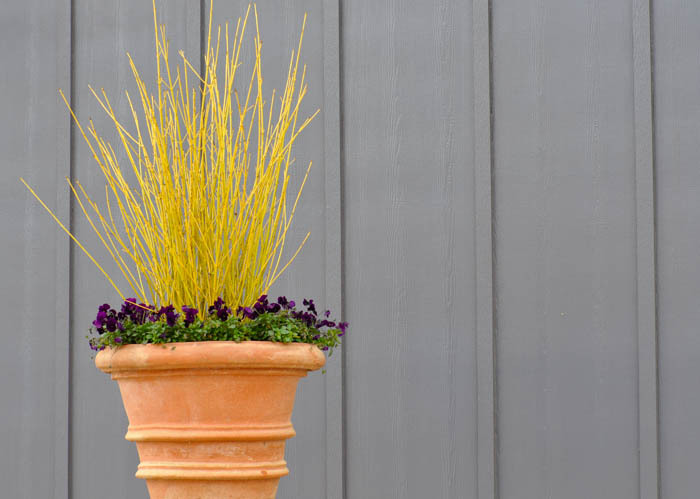 Example of yellow branches used in a spring or early fall container. 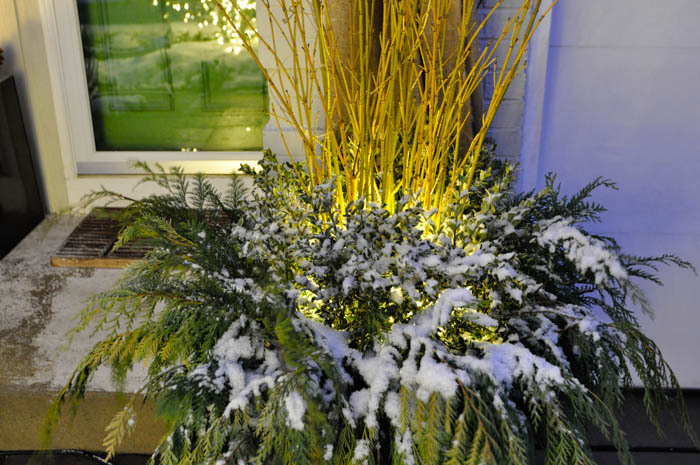 Example of yellow branches used in a holiday container. We placed LED Christmas lights around the base of the stems to provide a glow. 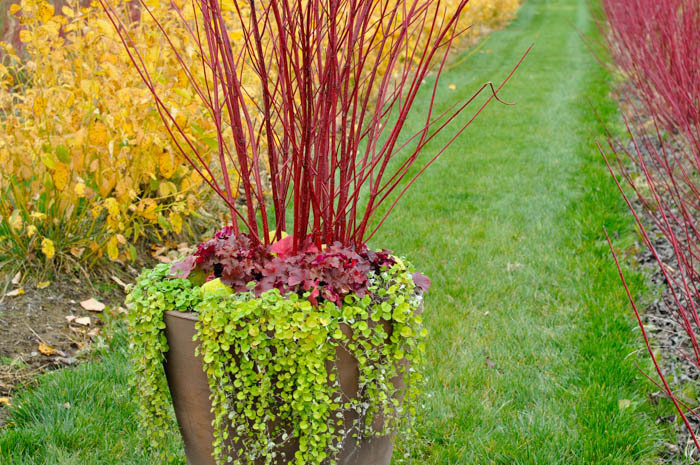 Example of Red Twig Dogwoods in a fall container. 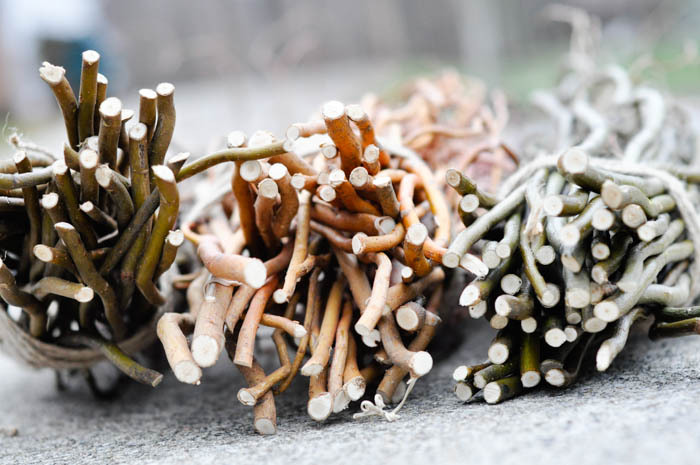 We also grow curly willow for cut branches. These also grow quickly through the season between 2 -6 plus feet in length. 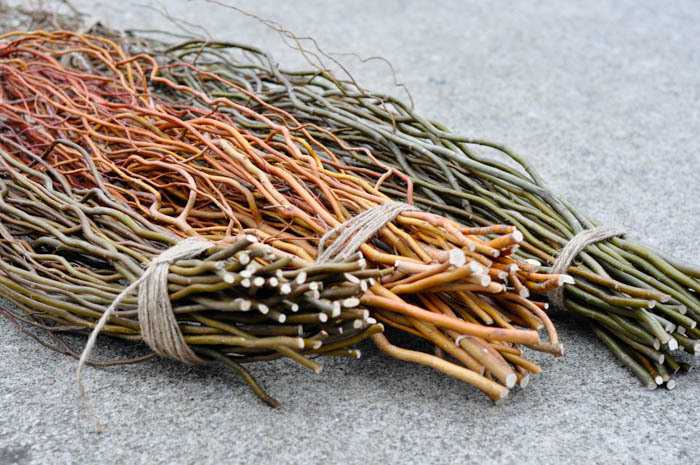 The additional benefit of these stems is the gnarly shape the branches grow and are very wide when used in containers. We grow three colors (left to right in images above and below): Black, Scarlet and Green. Example of curly branches used in a holiday container design. If you want to order any branches you can order from our Etsy Store. They are packaged in bundles of 50, but we can do in any order you wish. Also if you want a large bulk, you can email Joshua@mccland.com and get wholesale pricing. I will do a post dedicated to holiday decorating once we are done and that will include more examples of the branches in container designs. I have yet to decorate at home, and that is often where I do something a bit unconventional but also takes significant hours to execute. I would love to see how you extend the season with container designs or if you have any questions about using branches. 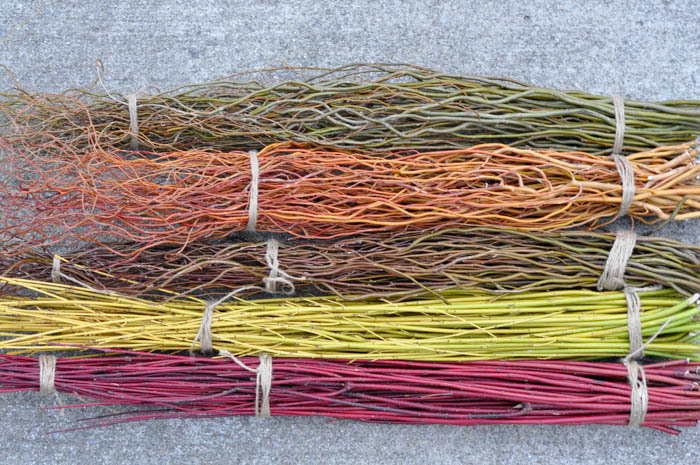 This entry was posted in Landscape Products, McCullough, My Work, Redtwig Farms and tagged cut stems, red twig dogwood, willow curly willow by Nick. Bookmark the permalink. Oh no! I’ve been looking for a good source for branches and now I’ve found one but I’ve already done my winter containers. I bookmarked the Etsy store for next year though. The yellow dogwood branches are particularly stunning. Erin, I’m so sorry we missed you….definitively keep us in mind for the future. Than you for following! Howdy! I could have sworn I’ve been to this blog before but after looking at some of the posts I realized it’s new to me. an long time. But, hey, you can chop up some fresh cilantro and add it if you want. have to face a diet knowing there will nagging food cravings. it stabilizes blood sugar levels. Opera. Do you have any ideas to help fix this issue? Glad I found this website last year and ordered Red twigg branches through Etsy, per you recommendation. I am very interested in ordering the YELLOW TWIGG now for this year for Spring thru Fall, however, Etsy does not have them. Any information on purchasing would be greatly appreciated. Thank you! Sorry I am just now seeing your comment. we are no longer selling via Etsy, but you can order inventory via redtwigfarms.com. 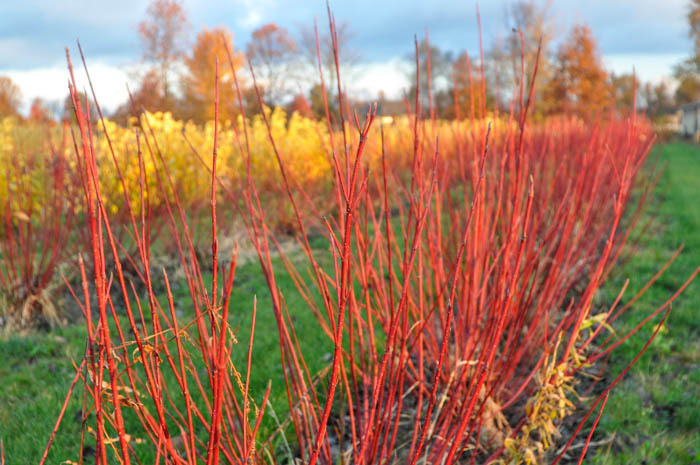 We are not harvesting dogwood right now, but there could be some stock available. My brother Josh handles the product and if you mention you purchased awhile back via Etsy and let him know what you are looking for, he might have something for you.